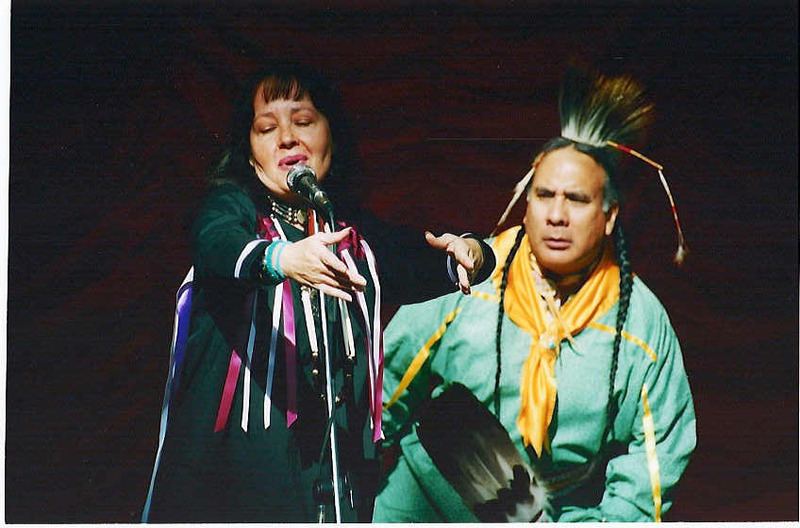 New York City based Native American Storytellers Donna Couteau Cross (Sac and Fox)and Joe Cross (Caddo/Potawatomi): contemporary and historical storytelling, songs, traditional dance. Leafarrow Storytellers Donna Couteau Cross and Joe Cross present an interactive show featuring coyote tales, creation stories and historic folklore filled with tribal family values. 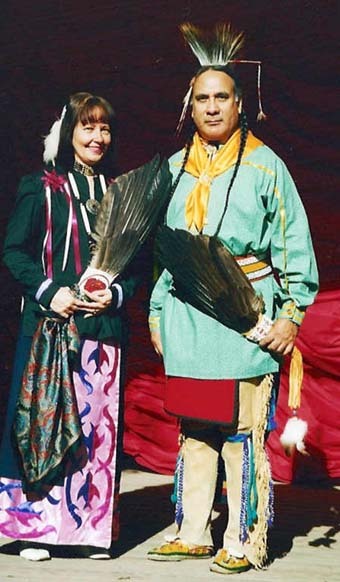 They are a married couple using story, song and dance to celebrate the special relationship the Native American people have always had with the Earth and their respect for the natural environment. They have brought their unique performances to the National Museum of American Indian Smithsonian, United Nations International School, Philadelphia Museum of Art, Newark Public Library and Clearwater's Great Hudson River Revival. Donna and Joe are proud to be representing our New York community on Sept 21-26th, 2004 in the grand opening of NMAI's Washington, D.C. museum. They have been selected as 2 of 14 storytellers representing the Western Hemisphere. "Highly regarded North American storytelling and dance performances"
"Among the best we have ever featured"
"remarkable storytelling exudes considerable charm, drama and filled with life"
"A warm and genuine way of interacting with young children"
"Delightfully entertaining as well as educational"
"Experience, talent, poise and delightful sense of humor!" "By the end of the performance they had the whole audience out of their seats and joining in the dance circle"
American Indian Dance Theatre (Wolf Trap) -The American Indian Dance Theatre was formed in May 1987 when more than 20 Native American dancers, singers and drummers, representing a variety of North American tribes, gathered in Colorado Springs to begin rehearsals as a revolutionary new theatrical dance company. Brought together by Barbara Schwei, a New York based concert and theatrical producer, and Hanay Geiogamah, a renowned Native American playwright/director and a member of the Kiowa and Delaware Tribes of Oklahoma, these dancers and musicians form the nucleus of the American Indian Dance Theatre. Kevin Locke welcome - Kevin Locke (Tokeya Inajin is his Lakota name, meaning "The First to Arise") is known throughout the world as a visionary Hoop Dancer, the preeminent player of the indigenous Northern Plains flute, a traditional storyteller, cultural ambassador, recording artist and educator. Johnny Moses on the Web - Johnny Moses is a Tulalip Native American raised in a remote Nuu-chah-nulth village of Ohiat on the west coast of Vancouver Island, B.C., Canada. He was raised in the traditional ways by his grandparents, and sent by his elders to share their teachings with all people. Johnny is a master storyteller, oral historian, traditional healer and respected spiritual leader. 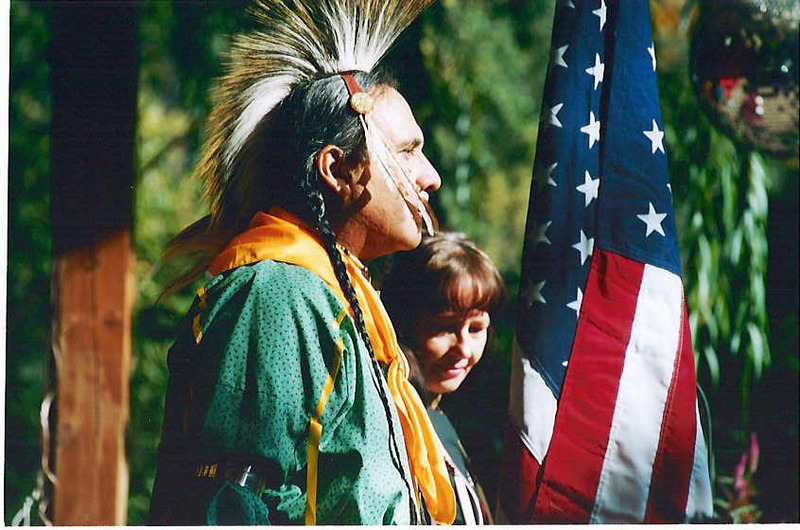 American Indian Community House - AICH was founded in 1969, by Native American volunteers as a community-based organization, mandated to improve the status of Native Americans, and to foster inter-cultural understanding. Since its inception, AICH has grown into a multi-faceted social support agency and cultural center with a staff of 35 that serves the estimated 27,000 Native Americans in New York City. American Indian actors, singers and other celebrities. Casting, photos, bios, movies, TV, info. Native AmericanSupport Group of NYC - Native American, Alaska Native & International Indigenous issues. 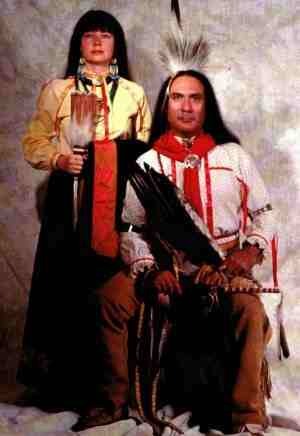 American Indian Activist Sites and Media. 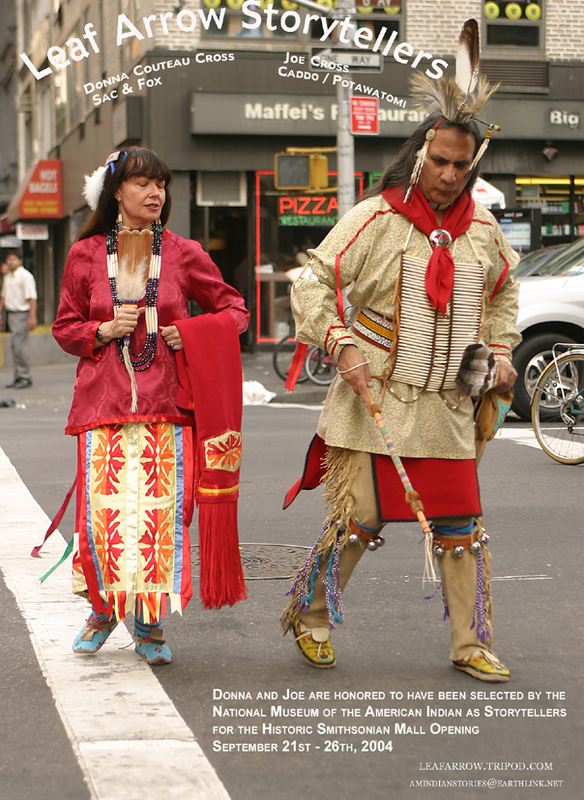 New York City Native American sites and events. NYC guide and media. Tlingit National Anthem - Alaskas Natives Online - Alaska Native and American Indian history, art, celebrities,culture, dance, storytelling, photographs, music, languages, writers, radio, and media. Alaska Natives Online, tourist attractions. Alaska Native and American Indian issues, links and useful internet resources. Copyright (C) 2000 - 2004 Leaf Arrow - Native American StoryTellers. All rights reserved.